One of the more exciting developments since I arrived at HBU has been our move to Division I NCAA athletics and the recent founding of the HBU football program. 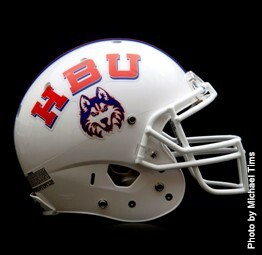 This is a great step for HBU because football is one of the humanities. HBU is a Christian Liberal Arts University. As such we seek to be a national comprehensive university under the Lordship of Christ. Football, in particular, has a long tradition of being central to the American university experience. In beginning Division I football at HBU we create an opportunity to serve God in an area and at a level that Christian universities have often ceded to secular institutions. For many of the same reasons we are taking on the challenge of Christian graduate education (Pillar Three) we should take on the challenge of having among the best athletic teams in the nation. Of course Christian universities shouldn’t imitate everything that other universities do. The mere presence of a program or area of study at Harvard doesn’t mean that HBU should have that program as well. Athletics, though, is a central part of culture and a place where we can glorify God. Play is one of the things we all do. The Olympics and the Super Bowl are consistently among the most watched TV programs. Further, this is not just populism or mere entertainment. In sport we see the excellence of the human body and mind, created by God. It is not just dance; competition brings out virtues such as physical courage, perseverance, winning and losing well, selflessness, and trust in the context of forces which are in active opposition to your goals. The clock, the scoreboard, and the fans matter. Football has a special place in my heart because it displays the virtues of American social life and holds up a mirror to our anxieties and faults. The large highly analytic coaching staffs, the coordination of specialized players with very distinct skill sets, the speed and the power of the game, all reflect how we as Americans live. The Houston Texans win football games by the courage of Ben Tate and the planning of Wade Phillips. We won WWII through the combination of individual bravery at one level and the massive coordination of our industrial might at another. American business and science is made successful by the work of men and women which innovate constantly. I find it hard to not admire the frequent developments of the zone blitz in the same way I find it hard to not admire the Moon landing or the development of anti-HIV drugs. Additionally, our worries about the long term effects of concussions parallels are concerns about how to harness the vitality of capitalism while taking care of the least among us. This is not to say that winning a game is the same thing as curing disease; the latter is more important than the former. But in the same way that visual art can simultaneously be both an effect of culture and a cultural actor (think of the famous”Hope” poster) so too is sport a result of what we are now and part of the process of our becoming. In bringing football to HBU we are bringing a part of American life to HBU. In celebrating football we are celebrating our humanness. College athletics is not a contradiction in terms, because like art, theater, philosophy and literature, athletics is not just entertainment, it is essential to the human condition.